Hoosiers on the Rise: Can Indiana Stay in the Top Three at NCAAs? Commentary by Eamonn Keenan, Swimming World College Intern. Leading up to the 2018 NCAA Division I Men’s Swimming and Diving Championship, swimming fans all over the world were anticipating one of the tightest team races in history and some broken barriers. Who will win, Texas or Cal? Can Caeleb Dressel break 18.0 or 40.0? But the first barrier to be broken wasn’t even in the conversation: the first sub-1:30 200 free from Indiana’s Blake Pieroni lit up the pool on day one. It was so fast and unexpected – the perfect storm of exciting swimming. On day two, there was more fast swimming, more tight races, and a dogfight brewing between Texas and Cal – which is why it was so perplexing to see an unfamiliar name at the top of the team scores: Indiana. Maybe it’s just the buffer of diving points, or perhaps Indiana just had a really good day; but no one thought that lead would last. Day three came and went, however, and the Hoosiers continued to sit in first. Disbelief grew into contemplation – Indiana might win NCAAs? Really? That would be crazy! – which gradually transformed into hope. It would be one of the biggest upsets in history, and no one saw it coming. Day four concluded with a third place finish for the IU men at 422 points. Given their seat at number one for the majority of the meet, it felt slightly disappointing; however, their improvement over the last four years suggests that a third place finish is a momentous feat. From 2015 to 2017, the Indiana men placed twelfth, ninth and then seventh. To jump from seventh to third in a year is unheard of, especially given that Indiana only had 13 swimmers and divers competing at nationals (note: divers only count as ⅓ of a swimmer, so technically Indiana brought 15 athletes) compared to the 18 that Texas and Cal brought – the first and second place teams. The question arises is this: Can Indiana maintain its spot among the top three? Out of the 15 athletes they brought, six of them are seniors. IU will lose 94 individual points to graduation, including the 43 points amassed by Pieroni. The biggest loss from graduation is in their relays – they put four of five relays into the top 8, most notably winning the 400 medley relay. Out of those five, they only have one relay that returns every member for next year, which is their 200 medley relay that got fourth. Pieroni and sprint specialist Ali Khalafalla were veteran free relay legs for the Hoosiers, and their 200 free relay will also graduate Josh Romany. Despite how many seniors they are losing, Indiana actually returns the third largest amount of points next year with 180 individual points. Texas (251), followed by Cal (212.5), return the most points in the division. 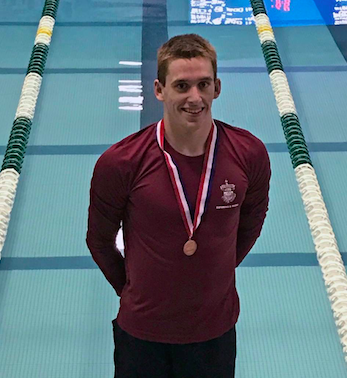 More importantly, the loss of the Pieroni anchor on the free relays will be made up for by the recent addition of Zach Apple, who will be transferring to Indiana from Auburn for his final season as a collegiate athlete. Apple is a freestyle specialist, boasting personal bests of 18.82, 41.36 and 1:31.18. The addition of the former Auburn tiger will certainly help mitigate the loss of Pieroni and keep IU’s free relays in the top eight. With the transfer of Apple, Indiana actually returns the second most points in the nation (218.5), as the rising senior amassed 38.5 points at last year’s NCAAs. Indiana’s medley relays seem to be in good hands for next year, especially with Apple holding down the anchor legs. With the return of American record-holder Ian Finnerty, consistent 19 and 44 fly splits from Vini Lanza, and breakout freshman backstroker Gabriel Fantoni, we could realistically see a two-peat in the 400 medley relay and a push for top three in the 200 medley relay. Freshman Bruno Blaskovic could also be a key piece to develop for the Hoosier sprint relays, as he split four 18.8 range splits throughout the prelims and finals of the short relays at NCAAs. Sophomore freestyle/backstroker Mohamed Samy had a breakout season as well, dropping his 2017 personal best from a 1:33.4 to a 1:31.73 in the 200 and lowering his 42.97 100 down to a 41.98. An improved Samy and primed Apple could easily alleviate the loss of Pieroni’s monster split on the 800 free relay, potentially moving their 400 free relay up a couple spots. The Hoosier’s radical improvement has certainly reflected in their recruiting as well. Distance ace and Indiana native Michael Brinegar will bring a mile time that would have placed fourth at nationals this year – a huge pickup for the IU distance group. In-state sprinter Jack Franzman brings a swift pair of 19.74/43.44 freestyles that could potentially help fill the holes in Indiana’s free relays next year. Whereas the top two returning teams in Texas and Cal seem to be a lock with their returning points and talented recruiting classes, next year looks to be a battle for the Hoosiers to maintain their position. NC State is another school with a loaded incoming class, and they are poised to challenge for third. Florida, although they also have a stacked recruiting class, only returns 16 points next year and will perhaps struggle to even hold their spot at fifth. All in all, the future looks bright for IU – hopefully we’ll expect them this time. Good article. IU’s Coaching staff has changed last year as well. They brought in Coley and he obviously made a huge impact, as did diving. The Hoosiers will be in a fight for 3rd next year as tx and cal are too deep, thought they will likely win a few relays. As long as Ray is at the helm, Indiana can do anything.